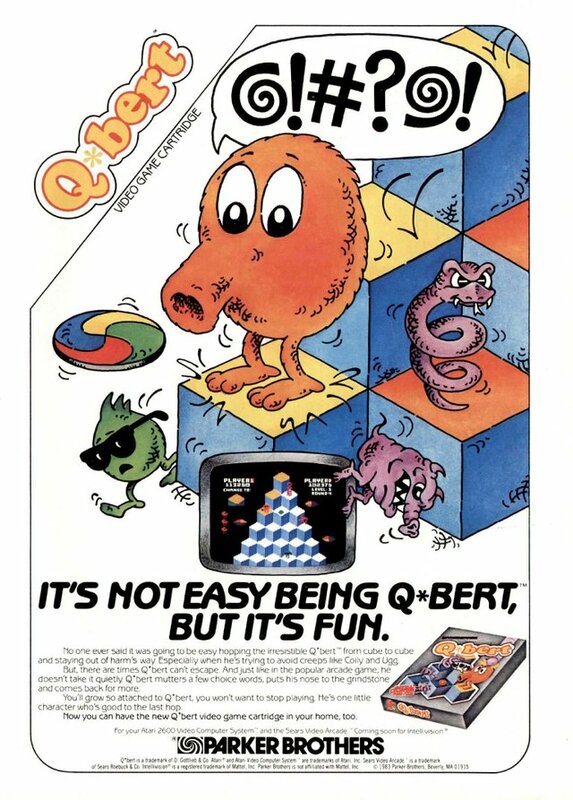 While there can be no doubt that Q*bert is one of the great arcade classics and one of the most recognizable classic arcade characters, I always found it to be incredibly frustrating. Yes, it was a difficult game but it isn't really the difficulty itself that really bothered me. It was the fact that I was always leaping to my death by accident because I never quite grasped the pseudo 3D viewpoint. For those that don't know, in Qbert you controlled...well, Qbert...in his effort to escape various creatures and obstacles by leaping around a pyramid. Game play was fairly simple. You just jumped from square to square up or down the pyramid. The goal was to hop on each square to change its color. Once all squares were changed, you proceeded to the next level. Of course you had to avoid getting trapped by the various on-screen enemies. As the levels progressed, things got harder. You would have to jump on each square multiple times, enemies would move faster and there would be more of them, etc. Q*bert was first released to the arcades in 1982. Ports to various systems started appearing the following year. While this ad is targeted towards the Atari 2600 version, there were a wide variety of systems this game was ultimately available for. Because of the limited nature of the Atari 2600, it really isn't one of the better ports. The graphics were actually ok for that system but the pyramid was smaller and there were fewer enemies. The controls also suffered. If you are looking for an original copy of the Atari 2600 version then they are relatively common and can be had for a reasonable price. You can always use emulation too. However, if you really want to play Qbert you are better off using MAME to emulate the arcade version or checking out the more recent release Qbert Rebooted which was released for various modern systems in 2015 and includes a port of the original arcade game.